BCNA is so proud to have delivered more than 150,000 free My Journey Kits since its launch in May 2004. You may be one of those who received My Journey Kit. If so, I hope you found it both helpful and reassuring. Though there have been a number of different versions of My Journey Kit over the years, with updates and other changes made, one thing remains the same – it always delivered the high-quality information that people diagnosed with breast cancer need. I am very excited to let you know that, from this month, we are going to deliver information in a new way – via the My Journey digital app, which will be available on your computer, tablet or smart phone. The My Journey app will provide Australians diagnosed with breast cancer with up-to-date information and support that is relevant to them. After entering some information about yourself and your diagnosis, the app will give information tailored to your specific needs. Some people tell us they receive too much information after their diagnosis, and it can leave them feeling overwhelmed. Others say there are things they wish they’d known earlier. Our aim with My Journey is to provide the right information, at the right time, to the right people. For example, a person who has only recently been diagnosed may be given information to help them understand the treatment that has been recommended for them and decide whether to have their treatment in the private or public health system. If a person has children, the app will give them information about how to explain their diagnosis to them in an age-appropriate way. But My Journey isn’t just for people newly diagnosed with early breast cancer, it’s for people at all stages of their breast cancer journey – including people living with metastatic breast cancer. As more treatment options become available and research makes new discoveries, a digital app allows us to share the most recent information in a more timely and cost-effective way than our previous printed My Journey Kit. Being able to personalise information through the app will help us to better meet the specific needs of young women, women with ductal carcinoma in situ (DCIS), and men with breast cancer. People will be able to easily find information appropriate to their sub-type of breast cancer and treatment recommendations, rather than wading through information that may not be relevant to them. We will be able to build on our high-quality written information with information in a number of different online formats, including videos and podcasts. Needless to say, this a big change from posting out kits in the mail! However, something that isn’t changing is how important it is for us to hear from you. The insights of people diagnosed with breast cancer have always been essential to the improvement of our information and services. A great advantage of a digital resource is that we can continually update and improve it. Some of you may worry about what My Journey means for people who prefer to receive printed information or do not have easy access to the internet. It is really important to us that everyone can access the information they need. We will still provide people with printed information if it’s the best option for them. For those who do have access to the internet, health professionals will start referring their patients diagnosed with breast cancer to My Journey this month. This will give those people faster and more tailored access to the information they need. If you’d like to see what the new My Journey is all about, visit bcna.org.au/myjourney. 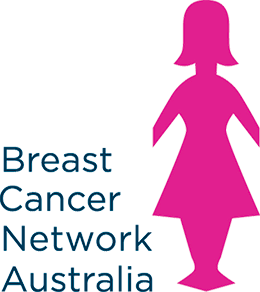 This month is also significant as it’s Breast Cancer Awareness Month. Check out our October calendar to see some of the activities that are happening around Australia during this month.